“Ph-nglui mglw’nafh Cthulhu R’lyeh wgah’nagl fhtagn”—“In his house at R’lyeh dead Cthulhu waits dreaming.” According to H.P. Lovecraft horror awaits humanity in the depths of R’lyeh, where Great Cthulhu lurks in his crypt. What lurks in this volume, a collection from Crypt of Cthulhu magazine, is horror, too, the literary kind. As you grow increasingly absorbed, slowly turning the pages with fright-numbed fingers, you’ll see what marvels and terrors have kept many readers loyal to Crypt of Cthulhu, which, yes, I will admit to editing. In this collection I have tried to present a cross section of Crypt, including representative genres, topics, principal contributors to the magazine, and authors treated in our articles. The main focus, as always in the magazine, is on criticism and research, and Lovecraft forms the basis of more of this than anyone else does. But you will also find discussions of Robert Bloch, Robert E. Howard, Henry Kuttner, Lin Carter, Brian Lumley, Colin Wilson, August Derleth, and Clark Ashton Smith. There is a pinch of fiction, including a new “posthumous collaboration” based on a newly discovered and quite extensive set of notes by HPL. A handful of our trademark satirical pieces round out the volume. Thus I think the book fulfills its promise of providing “the horror of it all,” the whole Cryptic gamut. The title is not, as one might expect, “The Best of The Crypt of Cthulhu” since there is simply too much to choose from. The contents of this collection are among the best, but that would be a peculiar title! 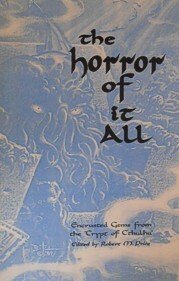 The Horror of It All: Encrusted Gems from the “Crypt of Cthulhu”. Edited by Robert M. Price. Mercer Island, WA: Starmont House; 1990; ISBN 1-55742-123-4; paperback; 204 pages.